The Grand Ole Opry is a weekly country music stage concert in Nashville, Tennessee that has presented the biggest stars of the genre since 1925. It is also among the longest-running broadcasts in history since its beginnings as a one-hour radio "barn dance" on WSM-AM. Dedicated to honoring country music and its history, the Opry showcases a mix of legends and contemporary chart-toppers performing country, bluegrass, folk, comedy, and gospel. 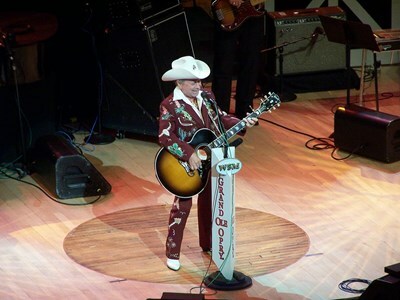 This description uses material from the Wikipedia article on Grand Ole Opry and is licensed under the Creative Commons Attribution-ShareAlike License (view authors). 48 people want to do this.